Taken in Michigan's Eastern Upper Peninsula. 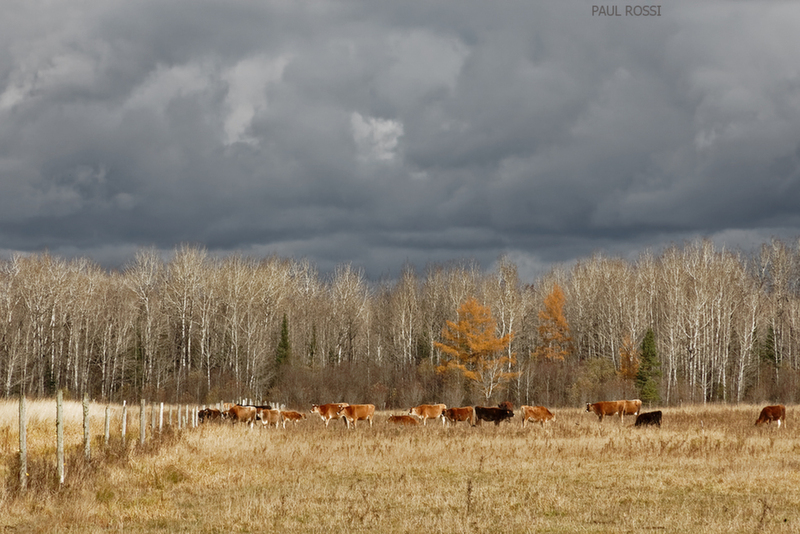 One day while working on our family garden on this farm I noticed the dramatic sky and sunlit pasture. So I ran to my van to get the camera, and ran to get the image before the light disappeared. It did, moments after this image. Love this Paul- so many interesting features and contrasts- the fence leads us back to the treeline, the light trunks up to the dark clouds. The cattle are lovely colors and even match the foreground trees. I like that the light is still on the cattle and field , even as the dark clouds roll in. A lucky catch and a fine one-very pleasing and well composed. Nice contrast between the dark clouds and the lighter trees and field. So much to enjoy with this beautiful scene, Paul. Great composition, beautiful colour palette and light, and that dramatic, stormy sky. This image has a timeless quality that is so appealing. Love it!